From its early days as the travel arm of AARP (American Association of Retired People) beginning in 1958, Grand Circle Travel has grown and expanded as an independent company focused on providing meaningful travel experiences for the "over-50's." While it now offers a full range of both cruisetours and land programs, the original operations focused only on discounted European extended-stay programs, most occurring during the winter in the south of Spain. As a later outgrowth, Grand Circle began to offer escorted tours around the world, always with a strong emphasis on excursions and enrichment, though cruises were not then part of the product mix. The company was acquired in 1985 by Alan and Harriet Lewis, who have taken operations to new levels by building on the original base and greatly expanding the offerings and destinations available. One continuing feature has been the decision to avoid public advertising, preferring to focus on past guests, referrals and direct requests for information. They instituted a system of what would come to be known as Program Directors, starting out as resident hosts, guides and lecturers and developing over the years into a hallmark service for the company. With each new destination and/or program, they opened regional offices across the globe to provide support and monitor operations in an area. These new options often came at the request or suggestion of their past passengers and guests, who form sort of an ongoing "alumni" association. So it has been with their approach to cruising. 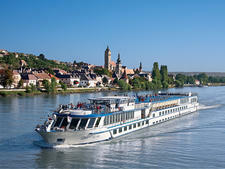 Starting in 1997, Grand Circle began promoting European river cruises on fully and partially chartered ships to its clientele. Pleased with the enthusiastic response, Grand Circle sought to ensure both the quality of the product and full control of the operations by committing to having its own ships built, beginning with River Symphony in 1998, followed over the years by a series of constantly improved vessels in various areas of Europe, Russia, the Mediterranean and Egypt. The company also runs chartered operations in Europe, Panama, Antarctica, Burma and China, under both the Grand Circle and Overseas Adventure brands. Part of Grand Circle Travel's success is evident from the remarkable level of repeat business; on most departures, over half of the passengers have traveled with Grand Circle before. 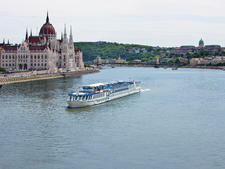 Many cite the unified experience of combined small-ship and river cruising along with the creative shore excursions and learning experiences either included or offered as attractive options. Along with this is the company's system of using what are known as Program Directors, a combination of cruise staff, tour guides and educators. They are local residents with a background in history, culture and geography who accompany each departure that Grand Circle operates and who serve to explain and enhance the passenger's knowledge, awareness and enjoyment during the cruise or cruisetour. Certainly, Grand Circle is doing something right. Small-ship vacations are Grand Circle's top sellers, and as the fleet has expanded, it's posted an average of 30 percent or more growth per year. Along with its current operations, mention should be made of the company's sense of commitment in the areas where it operates, not only by maintaining actual offices for each region, but also its commitment to responsible tourism overall. The Grand Circle Foundation has committed over $92 million in the last 20 years to preserving cultural traditions and advancing education -- in Egypt's Valley of the Kings, the company has funded the construction of information/shade pavilions to make the experience more worthwhile. Currently, the Foundation supports about 100 schools in 30 countries. 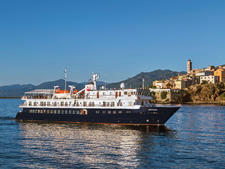 Grand Circle offers a full range of small-ship cruisetours for the over-50 set. While Grand Circle's ships are designed for the areas in which they operate, the ships are as much about comfort and convenience as destination. Cabins are spacious and well appointed. On some ships (Western Europe) upper-deck cabins have true balconies, while lower decks have large windows (the lowest deck windows are barely above water level). Generally, the Europe-based ships tend to have twin beds only. Bathrooms are small to roomy and excellently fitted out, and cabins are kept spotless. Usually, CNN, movies, and alternate language and music channels are available, along with an onboard info channel. Dining is handled professionally, and depending on the ship, will be a mix of buffet (often breakfast and lunch) and served (dinner). Menu options vary, but local and regional specialties are always included and may be featured selections. Think chicken paprikash or wiener schnitzel or profiteroles au chocolat. Specialty evenings are usually offered -- an Egyptian buffet -- depending on the locale and itinerary. General entertainment is low-key and casual; nobody goes on a Grand Circle cruise for karaoke or bingo, though both may be offered. There may be a costume night, or a black-and-white dress evening, or a passenger/crew talent show. They are all fun and people enjoy themselves. The real focus of any Grand Circle cruise is the chance to experience other cultures, histories, traditions and people. Through onboard lectures and excursions ashore, through talks and meals with local people and visits with or demonstrations by local artisans, passengers have a chance to expand their knowledge and understanding of other places and those who live there. The responsibility for guiding and leading these efforts lies with the Program Directors, local residents with a deep knowledge of their culture and the training and ability to convey it to others. There will be several on each cruise, and they will be both cruise staff and tour guides as well as resident experts on just about everything you might want to know. They will also aid the passengers in understanding and abiding by local customs, and in making discoveries, the company's term for those moments of enlightenment and understanding each passenger will undergo during their trip. As with all Grand Circle programs, the passengers on the company's cruises will all be over 50, in some cases much more so. The company does not market to families, and does not accept children as passengers. Passengers are generally well traveled, and at least half of them, if not more, will be repeat passengers with Grand Circle, and probably members of their loyalty program, the Inner Circle, an organization for those who have made three or more trips with the company. The majority will be married couples, though singles and clusters of friends traveling together are not unusual. (The line says that solo travelers represent 1 in 4 of its travelers, and a roommate-matching service is available.) Passengers tend to be a combination of retired, semi-retired and still active, college-educated, and with strong business and professional backgrounds. Given Grand Circle's strong focus on learning experiences, most of the guests are curious and open-minded, and eager to try new things. Also, since Grand Circle is an American company and generally (even on charters) does whole-ship trips, English is the language of the day at all times. The crews, and most especially the Program Directors, are all at the very least conversationally fluent. Passengers are all Americans or American-connected. Grand Circle's fleet, both for river cruising and small-ship ocean cruises, is necessarily varied and diverse. However, all of them, either purpose-built or purchased, are fitted out to be a part of the overall Grand Circle experience. Grand Circle's oldest ship was built in 1983, the newest in 2008. In all, the firm operates a fleet of about 50 small ships, about half of them owned and the rest privately chartered. In 1998, the cruise line inaugurated its first privately owned and operated river cruiser, the since-sold River Symphony, carrying 140 passengers in its 70 outside cabins; cabins with windows are a requirement on all Grand Circle-built vessels. Designed specifically to operate on the Rhine-Main-Danube river network, it would be followed by its sister ships, River Harmony (1999), River Melody (1999), River Rhapsody (1999) and River Concerto (2000). All of the Western European ships offer a restaurant with open single-seating, a lounge, a bar, some limited fitness equipment, an elevator and a sun deck, plus a small shop or service desk. Deluxe upper-deck cabins offer actual balconies, and most cabins are fitted with twin beds that cannot be converted. 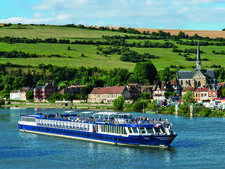 For European operations that might require slightly smaller ships for certain programs, the company would add its 60-cabin, 120-passenger cruisers -- River Debussy (2000), River Ravel (2001) and River Bizet (2002) -- known as the "Composer" series. 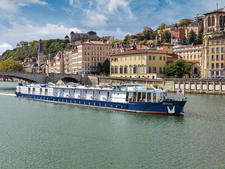 They offer most of the same amenities as the larger river cruisers, just on a more limited basis. River Bizet now operates primarily on France's Seine River. On a slightly larger scale, River Aria (2001) and River Adagio (2003) each hold 164 passengers in 82 cabins; they also have more extensive fitness facilities, including a whirlpool and sauna, as well as enlarged public areas. These ships can operate in the wider sections of the Danube near the Black Sea, where their size is not a functional problem. For its programs based in France, the line has two much smaller vessels, each with a capacity of 50 passengers in a series of 27 cabins. These are River Chardonnay (1999) and River Provence (2000). They are shallow-draft with no elevator and only two main decks plus a terrace area. They are more intimate and decorated in the warm Provencal style. These are also the company's only Western European ships whose names are not music-connected. In Russia, there are now two ships, each of which is larger than any of the Western European vessels -- 112 cabins for 220 passengers -- Tikhi Don (2005) and the refitted Rossia (2007). It should be noted there is no elevator access to the main Sun Deck Lounge and activity area; also, cabins are comfortable but rather simple and basic by Grand Circle's Western standards. While not considered river ships per se, Grand Circle does have several small ocean ships that it uses for voyages in the Adriatic, the Aegean and the Eastern Mediterranean. These include Athena (2007), Artemis (2007) and Arethusa (2008), all of which have capacity for 50 passengers.